Long before “Grey’s Anatomy” and Derrick “McDreamy” Shephard, there was a real live person named Derrick Shepard who terrorized defences with the Oklahoma Sooners in college football. 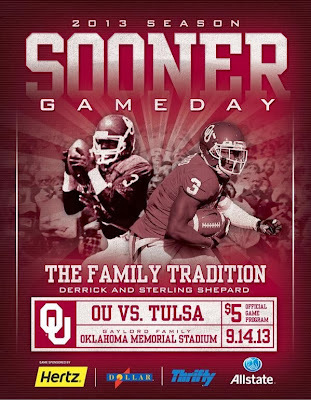 It was back when I was still an Oklahoma Sooners fan, and they were a national championship contender. Barry Switzer was their coach and they employed that wishbone, option offence run by quarterback Jamelle Holieway. And Derrick Shepard was their best wide receiver. The first time I saw Derrick Shepard play, was in the 1985 Orange Bowl after the 1984 season. The Sooners were upset 28-17 by the Washington Huskies. I recall Shepard being from Odessa, Texas which, if memory serves, is the community on which the movie "Friday Night Lights" is based. The Huskies had jumped out to a 14-0 lead, but Oklahoma rallied and Shepard scored the tying touchdown just before the half when he caught a Danny Bradley pass at the 47-yard line and ran it in. The Huskies would go on to win though, and finish second in the nation. Incidentally, they were the first Pac-10 team invited to the Orange Bowl. Anyway, what I remember most was the blazing speed Shepard showed on that pass-and-run play. It was just a sign of things to come. Derrick Shepard of the Oklahoma Sooners in full stride in he early 1980s. The Sooners realized they had blown any shot at a national championship in 1984 with that loss to Washington. Brigham Young University was undefeated, and won the national championship with a weaker schedule, but the Sooners would have made it an interesting discussion had they beat the Huskies. Consequently, they came into the 1985 season on a mission to win the national championship. They were ranked number two and reeled off three straight wins to start the season, against Minnesota, Kansas State, and Texas. That set up a showdown with the Miami Hurricanes, a perennial college powerhouse and national championship contender. But, Miami's national championship aspirations had dimmed with a loss to the Florida Gators in their season opener. However, in the world of college football, a loss early in the season is not as bad as a loss later in the season. The Hurricanes always had Oklahoma's number. From 1985 to 1987 Oklahoma was 33-3, with their only losses coming to Miami. This game started that string of three consecutive losses to the Hurricanes, as they went down 27-14 at home in Norman. Bradley had graduated, and the keys to the offence had been turned over to quarterback Troy Aikman. However, the Hurricanes would knock him out of the game as Jerome Brown sacked him, breaking his ankle in the process, and ending his season. In stepped freshman quarterback Jamelle Holieway who would have to guide the team the rest of the way. The Sooners would rebound, winning seven straight, including a 27-7 victory over number two Nebraska at home on Nov. 23. They finished the regular season 7-0 in conference play, wrapping up the Big 8 Conference title, ranked number two in the country and set to face undefeated Penn State in the Orange Bowl for the national championship. It was an interesting scenario. If the Sooners beat number one Penn State and Miami beat Tennessee in the Sugar Bowl, the Sooners were giving the national championship to their arch-rival. Obviously, they were cheering for the Volunteers in New Orleans. They still had to take care of business against the top-ranked Nittany Lions. Boy did they ever. After Penn State scored a touchdown on their first possession, the Sooners exploded for 16 second-quarter points including a 71-yard touchdown pass from Holieway to All-American tight end Keith Jackson. The tough Oklahoma defence led by All-Americans Tony Casillas, Brian Bosworth, and Kevin Murphy shut out the Nittany Lions in the second half, and cruised to the 25-10 win. Meanwhile, the Tennessee secondary riddled Miami quarterback Vinny Testaverde, routing the Hurricanes in the Sugar Bowl by a score of 35-7. That gave the Sooners the national championship. 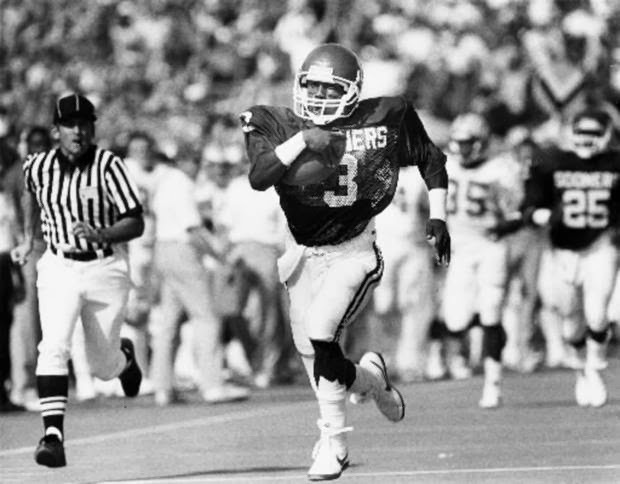 Derrick Shepard finished the 1985 season with 14 receptions for 273 yards and three touchdowns, and another reception for eight yards in the Orange Bowl. It was his third season with the Sooners. In his freshman season of 1983, he had 19 receptions for 314 yards and two touchdowns, then in 1984 he had his best season with 24 receptions for 305 yards and two touchdowns, plus three receptions for 87 yards and a touchdown in that orange Bowl loss to Washington. His numbers had declined in his third season for two reasons. The run-oriented Oklahoma offence afforded few chances to catch the ball. All-American tight end Keith Jackson had also arrived, presenting a big target with surprising speed. Shepard closed out his college career in 1986 with 13 receptions for 198 yards, and another reception for 36 yards in the Orange Bowl. His career totals in four years at Oklahoma are in dispute according to the Internet. Some sources state Shepard finished with 76 receptions for 1,237 yards, and other sources say 75 receptions for 1,221 yards. In any event, regardless of the numbers he was considered by many to be Oklahoma's best receiver. It turned into a serviceable pro career too, primarily as a punt and kick returner. He played 1987 and 1988 with Washington where he won the Super Bowl, split 1989 between Dallas and New Orleans, then returned to Dallas for 1990 and 1991. There is much more to the Derrick Shepard story than the numbers and big plays. In 1999, current Sooner coach Bob Stoops created the Derrick Shepard Most Inspirational Walk-on Player of the Year Award. I did not know that he had been a walk-on, earned a scholarship, then went on to achieve all these other things in his career. Sadly, the reason the award was named after him was that Derrick Shepard died of a heart attack at the age of 35 while he was an assistant coach at Wyoming. His son Sterling was just six years old. As a boy he presented the award named in his father's memory. Eventually, he joined the Sooners himself and was there to watch his own teammates receive. 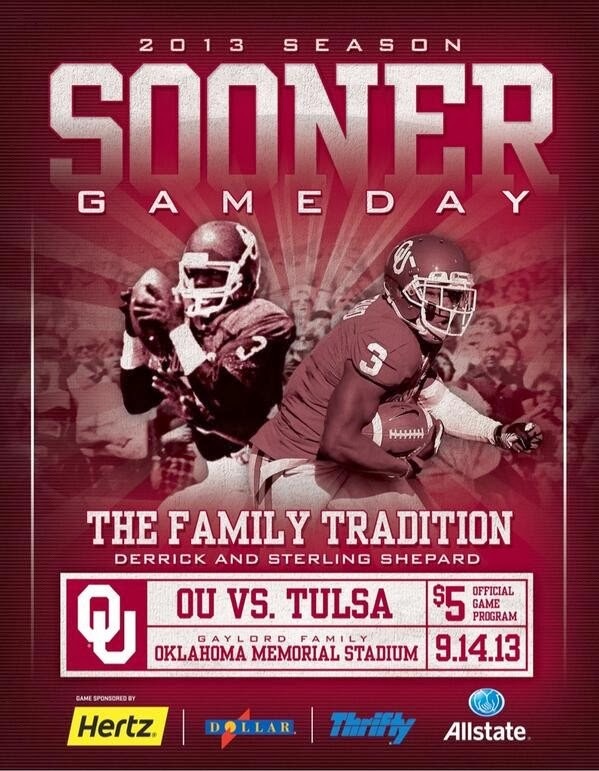 From the minute Sterling Shepard joined the Oklahoma Sooners he dedicated his play to his father. He even wears his father's number three to honour him. I'm sure Derrick Shepard would be proud.